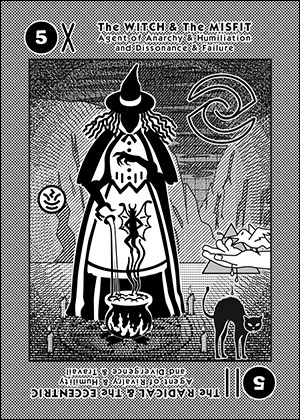 A Witch pours a poisonous ingredient into the mix. A turbulent, bubbling froth returns evil vapors. Malfeasance and malpractice bring the promise of transgression. She is a troublemaker with spells and potions that make people go wrong. Her insubordination breeds conflict and altercations. A Misfit who is unmanageable aggravates and violates. He is fractious and disobedient. He is defiant, he even argues with the forces that brought him into being - biting the hand that feeds him. He is out of control. He is a loser. This is a card for losers who can't get their act together, people who have problems with authority figures.